Thu., March 8, 2018, 8:31 p.m.
LAS VEGAS – Chimezie Metu had 22 points and 11 rebounds, and Southern California smothered Oregon State defensively to beat the Beavers 61-48 in the Pac-12 Tournament quarterfinals on Thursday night. Second-seeded USC (22-10) jumped on Oregon State early and hounded the Beavers all night, holding them to 31-percent shooting. Jordan McLaughlin had 13 points, five rebounds and four assists for the Trojans, who move on to face the Oregon-Utah winner in Friday’s semifinals. Oregon State (16-16) played a tough game in the opening round and was no match for USC’s early energy. Stephen Thompson Jr. scored 12 points for the Beavers, who shot 5 of 20 from the 3-point arc. USC played its way to the edge of the NCAA Tournament bubble with four straight wins, but a season-ending loss to rival UCLA made its margin for error slimmer. A loss to Oregon State, the Pac-12’s No. 10 seed, would have made it narrower still. The Trojans swept the regular-season series, winning by seven in Corvallis and 13 at home. 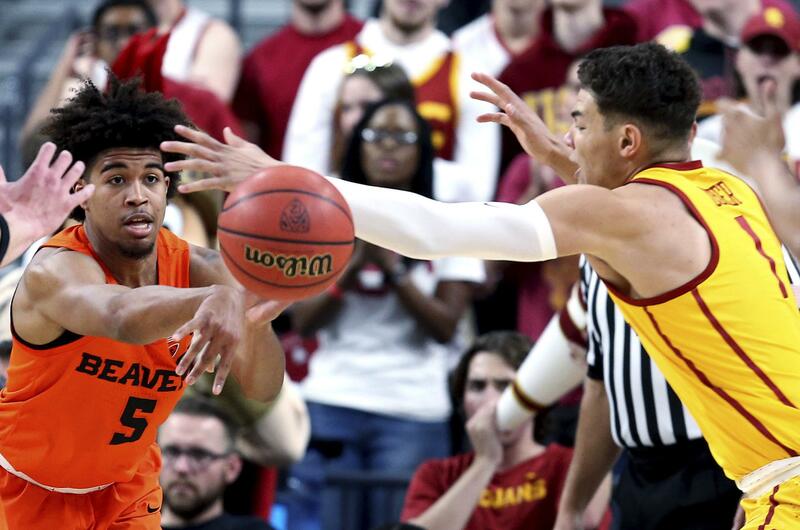 The Beavers reached the quarterfinals by spoiling Washington’s NCAA Tournament hopes and were hoping to do the same against USC. USC got off to a fast start, hitting six of its first eight shots to go up 16-5. The Beavers chipped the lead down to four, but struggled to find room for good looks against the Trojans’ physical defense. USC held Oregon State to 8-of-28 shooting to lead 29-19 at halftime. Oregon State cut the lead to 41-35 midway through the second half, but USC scored the next nine points to go up 50-35. Published: March 8, 2018, 8:31 p.m.